UPDATE (Monday, July 22, 2013): Truxton's American Bistro, the ever popular Westchester restaurant, opens a second location today in Santa Monica at the corner of 14th Street and Santa Monica Blvd. The new spot, which seemed to go from scaffold to heavy construction to open almost over night, will feature the same massive menu as the original - think wide-ranging fare ala Cheesecake Factory with a little added flair/taste, including big salads, burgers, sandwiches, pizza and their signature Monkey Bread. 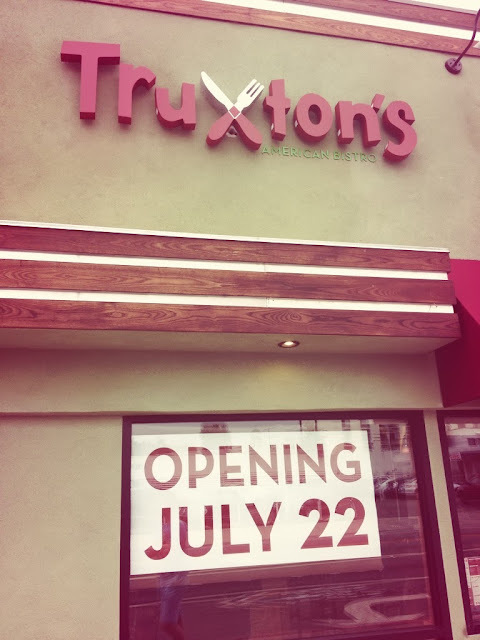 Truxton's Santa Monica serves lunch and dinner daily, brunch on the weekends and offers local delivery (which I'm guessing will be very well-received in the delivery moribund area).